Since I can remember I had this life motto: “Fortune favors the well prepared.” Living by it enabled me to achieve many things that I thought I’m not capable of achieving. Curious thing I was told on numerous occasions, is that I’m really good at improvisation, that I can come up with good ideas on the spot, I can talk on a topic without giving it much thought or make a decision without over-analyzing. It might sound a bit paranoid but the reason why it may appear this way to the outside world is that I most likely already thought about these scenarios in the past and I’m prepared to deal with them. So what may appear as improvisation is in fact just a good preparation that was done in the past. Be future oriented person. Don’t live in the past. Always try to see what is coming and be prepared for it. A lot of training I went through was like this. It wasn’t much focused on what I needed at that point of time but rather on what could be useful mid-term or long-term. Whether it was my MBA education, coaching training, participation in Toastmasters sessions or even writing this blog today it was always done with the idea that I may need the skills at some point down the road. This is a strategy that pays off if you have a clear idea on where you are going, what is your goal and also what are your life values. When then opportunity present itself, or you create one, you are ready to dive in and be successful. It could be summarized as “always train for the next job and not the job you have”. Important note here. I’m not saying you shouldn’t live in present and enjoy what you have today. No, if you want to be happy you must be able to live in the moment and enjoy the small things as they are coming. At the same time you need to take steps to ensure these small happy moments will keep coming also in the future. If you want to consistently perform at the highest level it means a consistent preparation. If you are really good at your job you can occasionally get away with improvisation but you cannot do it all the time as you could end up being inconsistent in the way you communicate, in the priorities you set and in the way others would perceive you. Being prepared is the easiest way how to build an image of a good manager and a leader. Being prepared means that you always know what is going on, you always have your facts straight, you always have an opinion, and you are consistent and reliable. For example, imagine just a simple meeting. If you have your agenda ironed out before the meeting and you have couple of talking points for each of the topics you will be able to focus on the important issues, you will make sure to deliver your message in a really organized and impactful manner and you will be seen as a strong leader who knows what he is doing, who is confident in his or her own abilities and in the direction he or she proposes. I hate surprises. At least in my professional life. Surprise means that I didn’t expect something happening, that I didn’t plan in advance for it, that I didn’t pay attention or I didn’t communicate well enough. I make it a point that I keep good enough communication with my team, and I constantly keep in touch with important stakeholders in my life to ensure that very rarely I get really surprised. Yes, from time to time there is a slight surprise but usually along the lines of something happening a bit faster than expected. A true leader should never be caught by surprise as I wrote in One Question You Should Never Ask. For example, in project management it is a good habit to always keep track of risks (and probability of them occurring). When managing software development projects you should always want your team to analyze the current status of the project and come up with three risks with biggest impact and three risks with highest probability of occurrence. If the team couldn’t come up with three you should still push for it so they really think hard. And when the worst risk that you see is something like “we may run out of coffee and get sleepy” that is the time you know the project is pretty safe. As the old saying goes: “If you don’t have a plan B you don’t have a plan at all.” When it comes to critical or important things in life you should never rely on one option, one person, one idea or one goal. As you would do with your money, diversify your portfolio to remove or at least limit risks and negative consequences. You will always have a preferred option what to do or how to do it but there might be other options close enough so you should never close your mind to them. This applies especially to situations when you don’t have things under control, when there are external forces that may impact your efforts. And yes, you should put all your energy and focus to achieve the primary objective. The Plan B just gives you a way out when all your efforts failed so you can easily cut your losses and start in a new direction without much fuss. You don’t need to have your plan B figured out in all the details but you must be able to turn to it fast enough when things go wrong. Typically in business you would have your disaster recovery or business continuity plans. They are usually pretty high-level as the chances you will need them are slim but when the time comes you and your team need to be able to act on them pretty fast. When your office catches fire or gets flooded you need to have a way to continue the business without significant interruption. 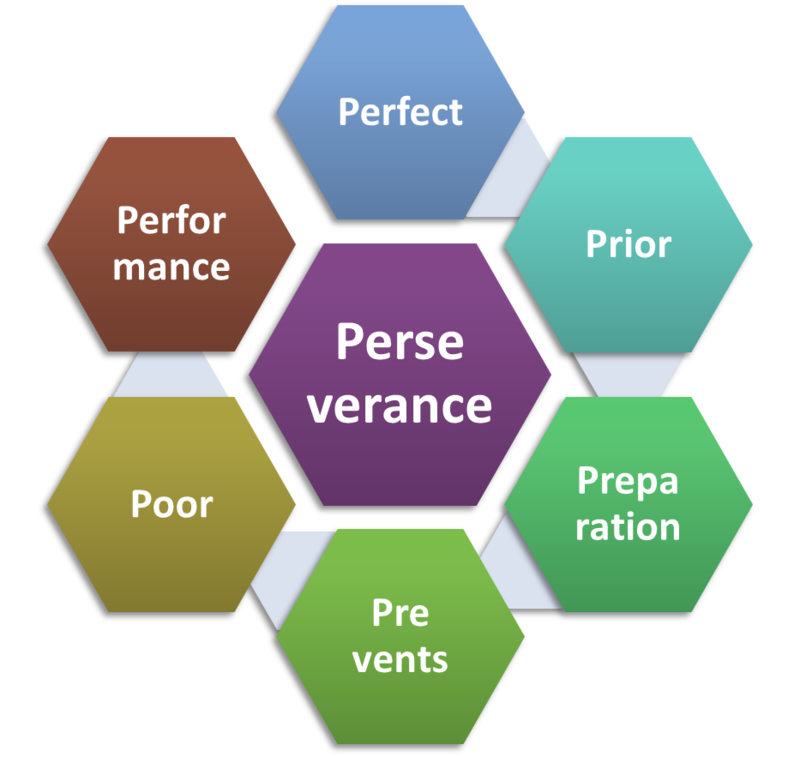 I love the concept of 6P believed to originate from the British army at the time of WWII: “Perfect Prior Preparation Prevents Poor Performance”. There are different versions from 5P to 12P but the 6P is easy to remember and goes nicely with my life motto. To make sure this concept really delivers on what it seems to promise I would add one more “P” – Perseverance. It may not rhyme with the rest but it is a key component. When you decide to do something then do it and do it consistently. Don’t give up until you achieved the goal you set to achieve. I’m not saying that you should be stubborn or inflexible. Of course, if the circumstances changed then you should re-evaluate your goal or the strategy to reach it. But if the only reason for giving up is your own excuse like “I don’t have time,” or “I’m too lazy today,” then you need to remind yourself of the seventh P and persevere. The reward will eventually come in the form of you achieving of what you set you want to achieve. What is your way to build new skills? How do you ensure you reach your long-term goals? And what is your leadership motto?